Today starts week 3 of my Primal/Paleo lifestyle experiment. I'm starting week 3 rather than stopping after 2 weeks because I'm not finding this very hard to maintain. I think my hardest day was the second day of the experiment. That day I had a fairly good headache most of the day. I assume that was the sugar withdrawal, but the lack of grains may have helped it along earlier in the week rather than the usual day 3 or 4 sugar craving. But after that day, I've not noticed any headaches or other sugar related symptoms. So, since I'm feeling pretty good and not finding it hard to eat good food, I'm going to keep it going. I suppose the goal is to eat like this all the time with the occasional splurge on sugar or grain-filled foods on special occasions. We'll see how it goes. I've been experimenting with coconut flour this past week. I looked at both almond flour and coconut flour at the grocery store; almond flour was $12 for a 1 lb bag while coconut flour was $6 for a 1 lb bag. So I bought the coconut flour. What I've found, though, is that coconut flour is a bit tricky and I really need a recipe to make things with it. I took a cake recipe and a cookie recipe that both used almond flour and combined them into a cookie recipe based on what I had on hand along with the coconut flour. It turned out so dry that I almost couldn't eat it. So I crumbled the cookies up into a flour consistency, added a couple more eggs, a stick of butter and some raisins then re-baked them. The second batch was much better but it's still too dry to call a success. I've ordered some almond flour from Azure standard. At $28 for 5 lbs, it's still very expensive, but a much better price than the grocery store. I have a feeling that if I really decide that Primal is the way I want to eat, I won't be using a ton of any kind of flour on a regular basis. I believe that trying to recreate the grain and sugar-filled foods with non-grain alternatives is just asking for disappointment. 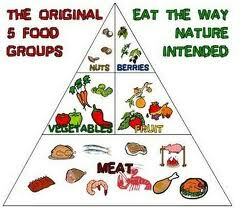 If I eat my meat, veggies, fruits, nuts and other primal foods, why do I need to recreate the others? I suppose snacking and breakfast are the main food categories that I haven't really mastered while eating primal. But I'm getting there. Below is a list of foods I've had on the menu while experimenting with Primal/Paleo eating.